One thing that I love about becoming a part of the farming community is that for the most part, folks are super helpful and make you feel like you are welcome. The chicken community is no exception. I have met some fantastic folks through online forums, and it was through such a forum that I met a lovely couple who breed all sorts of different chickens. What I was most excited to learn is that they breed Americauna chicks, the blue egg laying breed. How could I not get some? 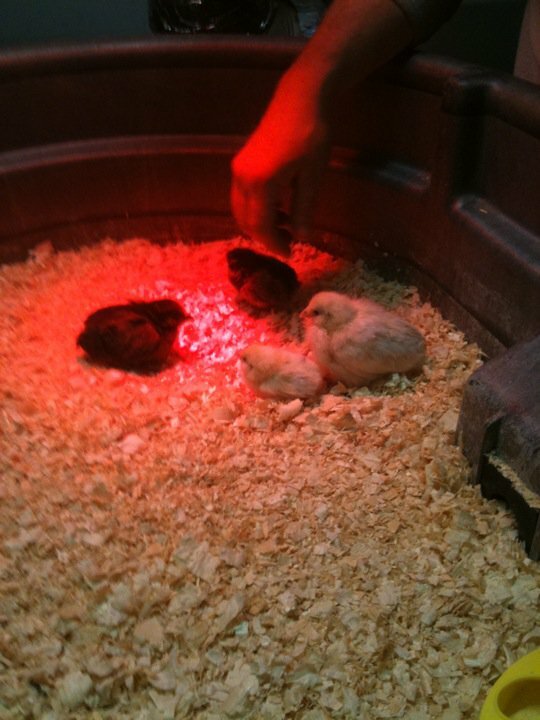 So I made the trek - over a two hour drive - and bought home four teeny chicks. They are the most adorable creatures, and I truly hope they are all hens. I keep calling them my "future egg layers". Thus far, they seem to want to eat, sleep, eat, sleep, and peep. There is a lot of peeping. In a small farm house with a limited ductwork system, the peeping can be heard in every room. Last night I thought we had crickets in the house, but no - it was my peepers in the basement. Excuse me while I tell the parrot that I no longer mind his squawking. Soccer fans on the farm?